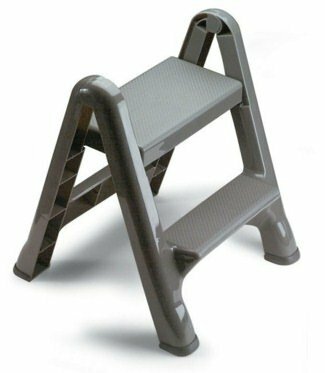 The Rubbermaid Commercial Products FG420903 Two-Step Folding Stepstool is ideal for maintenance activities and whenever elevation assistance is needed. Stands upright when folded and requires minimum space for storage. Supports loads up to 300-pounds (136.1-kilograms). Features slip resistant surfaces on steps and foot pads. Easy to transport, weighing less than 7-pounds (3.2-kilograms). Easy to clean and resistant to dents and rust. Stands upright when folded and requires minimum space for storage. Supports loads up to 300-pounds (136.1-kilograms). Features slip resistant surfaces on steps and foot pads. Easy to transport, weighing less than 7-pounds (3.2-kilograms). Easy to clean and resistant to dents and rust.